Punjab the “Golden State” of India has a rich and vivacious culture. Versatility is the keyword of its legacy. Vibrant are the colours of Punjabi culture. 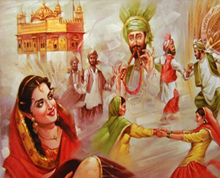 Rich cultural heritage of Punjab can be classified under: Artsand Crafts, Music and Dance, Festivals, Cuisine and Attire. Punjabis are renowned for their utmost interest in arts and crafts. Women used to weave wollen attire for everybody in the family. “Phulkari” is recognized worldwide for its intricate work. Shawls in silk are carefully hand-woven using traditional motifs as designs. Other famous crafts of the region include lacquer work, wooden work, Calico painting, paper mache` and many more. Wooden furniture is beautifully crafted by artisans with exquisite craftsmanship. Venetian lanterns known as “Fanoos” by Muslim artisans are a great display of craftsmanship. Music and Dance is the vein of Punjabi culture. Punjabis give importance to music and dance, never neglected at any occasion. Traditional music and dance has been engrained in its folk form. “Bhangra” is one of the most famous dance forms of Punjab. With the loud drumming of the dholak, people dance with zeal to the tunes of the music. “Giddha” is another important variant of dance practiced by Punjabi women. Bolis are lyrically sung and danced by women. Other popular dance forms are Jhumar, Dhankara and Gatka. Irrespective of age or religion, Punjabis love to dance and enjoy themselves to mark festivity. Folk music is the soul of Punjabi culture. Folk music comprises of simple musical instruments like dholak and dhol drum. Punjabi music relates to the zestful people of Punjab. Bhangra is a popular music form of Punjab. Boliyas are sung and music is played in tune with the lyrics. Festivals of Punjab mark fervour and happiness. Every festival is marked with music bringing the family together. Some of the major festivals are Lohri, Baisakhi, Holla Muhalla, Guru Nanak Jayanthi and Maghi. Lohri is celebrated as harvest festival on the solar equinox when the sun moves to Uttarayan position, by burning huge bonfires. Baisakhi is another important festival marked with the birth of Khalsa. This is celebrated in the month of April, as three days celebration. Holla Mohalla (Holi) is celebrated with great fervour using colours to mark the onset of spring season. Guru Nanak Jayanthi: birthday of Guru Nanak Sahib is celebrated on Karthik Purnima, with utmost devotion by the whole Sikh community. Punjab is renowned worldwide for its extensive range of delicacies. 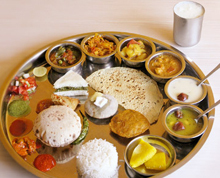 Cuisine deals with generous spread of chaats, stuffed paranthas, vegetarian and non-veg dishes and desserts. Makki ki roti and Sarson di saag are trademarks of Punjabi cuisine. Dishes are flavoured using extensive spread of spices. Rotis made of wheat flour, corn flour, bajra are a true delicacy of Punjab. Punjabi cuisine is extensive and lavish. Extensive use of butter and ghee make the dishes rich in taste and calories too. Lassi is an all time favourite. The traditional attire of people is Kurta-pyjama with turban for men. Women prefer Patiala suits as part of their traditional attire. However, the younger generation prefers trendy attire as per the fashion scenario. The NRI population has been a major influece regarding attire of the Punjabis.